Check the Training Schedule for an Appreciative Inquiry based training in a location near you. Privacy Note: This list is used occasionally and solely by the Clergy Leadership Institute to provide occasional Newsletters with appreciative tips and for advance notification of upcoming training events. Your email address will not be sold, lent or given to third parties. Please confirm the following information to be added or removed from our email list. I often hear leaders saying I am going to "light a fire" under an employee or group of people. In my experience when you try to light fires under people all you will get is burnt butts rather than sustained growth and development. A much more enlightened way to motivate people is to find the fire within them and fan that fire. 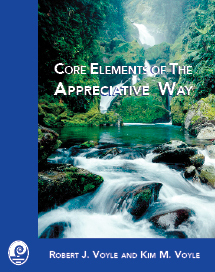 The appreciative way discovers the fire within organizations and individuals and orients this passion around the pursuit of shared goals.